Learning professionals continue to accept cloud technology faster than any other area of HR software due to the convenience, reduced administration and better user experience. And while learning systems are critically important to maintaining the ongoing health of a business, they are often given a lower priority than other business systems such as sales, finance, and payroll systems. 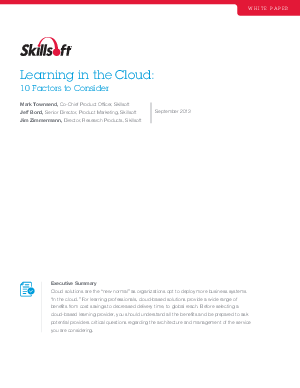 As a result, learning systems are an ideal candidate for the switch to cloud technology. In addition, cloud-based learning allows leaders of learning and development functions, who may not be technologists, to present a viable option and discussion point to their IT team. If you are not using or considering a cloud-based learning system, you are missing out on one of the most valuable opportunities to deliver a comprehensive learning solution to your organization. Choose a provider that has a history of experience with cloud-based solutions as well as a deep understanding of the learning needs you are addressing. To help you make an educated choice for your organization, we've provided information on the top 10 benefits of a cloud-based learning architecture.